I made my 1850s gown using Past Patterns 702 (Dart Fitted Bodices). I found some good reviews online, especially about the ease of construction, so I decided to give it a try. Although it was a useful starting point, and there are other nice things about the pattern, it is not a pattern I would recommend if you are small-busted and long-waisted. Pro: There are not a lot of pieces, so construction is not difficult. The pattern is relatively simple, and consists of pieces for the bodice front, bodice back, side back, your choice of a pagoda or coat sleeve, and an optional epaulet. There is also an undersleeve pattern if you make the pagoda sleeve. Pro: The fitting is done at the shoulders and side seams. The pattern suggests cutting out your lining as a mock-up, then having a friend help you fit it. When you sew your fashion fabric you finish the front closures before taking in the side seams to fit yourself. If it works, it’s very simple. Con: To employ this technique, you must have a friend help you, or a dress form with shoulders (because of the historically accurate dropped shoulder), or keep putting the bodice on and taking it off. 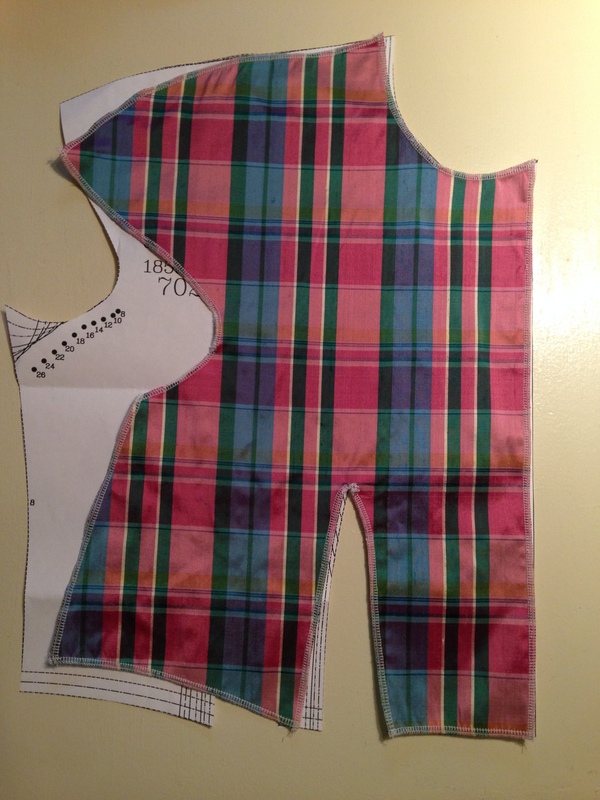 Con: The lining for the back of the bodice is one larger piece encompassing both the bodice back and side pieces. 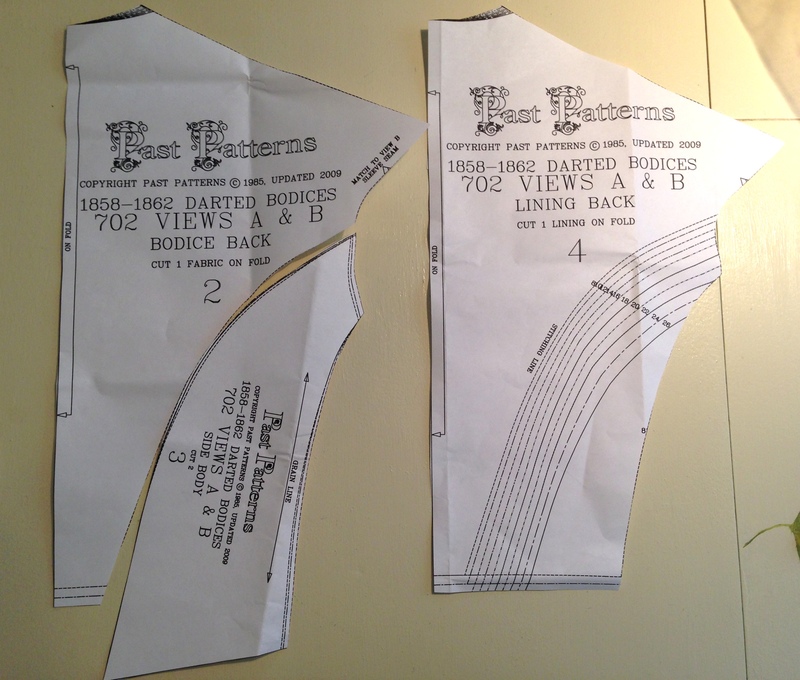 There is no explanation on how to translate the adjustment you made on one pattern piece into two pattern pieces. Con: The size chart is inaccurate and the pattern is too large. According to the pattern I am between a size 10 and 12. The size 10 was too large for me. Even when I recut the pieces to size 8, it was still too big. Con: There was a huge excess of fabric in the chest and shoulder area. Since I have a small bust I am used to taking in patterns a bit, but usually not as much as I needed to this time. I realized that this pattern is designed to fit someone with enough assets to spill over the top of her corset, and slightly broader shoulders. In the end, to make this fit I had to not only drastically alter the front bodice piece, and a little of the shoulder seam in the back bodice piece, but I had to also stuff my corset with bust pads when wearing the dress. This photo shows my fabric on top of the size 8 pattern (but with the size 12 seam lines at the bottom because otherwise it would have been too short in the front). I also had to move the darts a little bit. (My final pattern still had 2 darts, but I did not cut out the second one). Con: I am not sure how much of the problem stems from my adjustments, or if this is an issue you would encounter even without such a change, but my sleeves did not fit into the sleeve heads. I had to gather the sleeve to make it fit, and did not have the smooth transition I was expecting. If you have the ideal Victorian figure, and can fill out a corset, I think this pattern would be quite flatting and easy to put together. If you are on the petite side, it would be easier to find another pattern that does require quite so much adjustment. Posted in Victorian and tagged 1850s, Victorian. Bookmark the permalink.